This high end headphone amplifier and DAC includes an MQA hardware decoder and is a good choice for getting the best performance from a range of headphones. Mytek Brooklyn DAC+ is a DAC converter, preamplifier, balanced headphone amplifier and phono preamplifier, designed in NY, low-latency audio interface and a hi-end studio monitoring system. Variety of convenient digital inputs ensures the device is capable of connecting to a broad variety of devices from the sector of pro and hi-end applications. Despite the richness of accessible functions, device operation is simple and intuitive. All relevant data like sample rate, bit resolution and signal level are visible on the large and legible display. With the help of the friendly Mytek Control Panel application, you can control the device from a MAC or PC, which further simplifies the converter's operation. Subsequent versions of the firmware available at no charge on the manufacturer's website guarantee full compatibility with the newest versions of operational systems and allow continuous update of already unique functionality of the device. However, the reference quality of analogue handling and its musical sound is what distinguishes this unit from others. A high-quality DAC chipset (Sabre 9028PRO), a specially redesigned analogue section and an ultra-precise clock make the converter sound musical and true to the original. Redesigned analogue section ensures even better separation of channels and lowers noise level. Brooklyn DAC+ provides absolutely faithful sound processing. It is transparent but also very musical. options on the market within the device. Brooklyn DAC+ also works a classic, compact audio interface offering eight input channels and two DAC output channels with ultra-precise processing quality. A set of digital connectors permits linking of any AD converter, mic preamp, synthesiser and other AES, S/PDIF or TOSLINK equipped devices. A maximum of 4 such devices can connect and each digital channel can be seen within the DAC recording firmware at the same time. Quick drivers (ASIO) guarantee comfortable exertion in intricate tasks, where virtual instruments and effects (AAX, VSTi, VST, AU) are used. The device is compatible with any sound recording firmware. Studio One, Ableton Live. Pro Tools, Cubase or Samplitude, the Brooklyn DAC+ ensures effortless function on each of them. Brooklyn DAC+ is designed for individuals concerned in mastering, mixing "in-the-box" and all those who do not need many I/O channels, but appreciate the reference digital-analogue processing. High-performance amplifier is capable to drive any headphone providing an exact and dynamic sound. It permits you to attach two sets of classic headphones or one pair of balanced headphones. The vinyl record has become prevalent once more, so fans of the black disc can appreciate the ability to connect a turntable via the analogue inputs of the DAC. Brooklyn DAC+ is provided with a top quality phono preamplifier compatible with MM/MC cartridges. 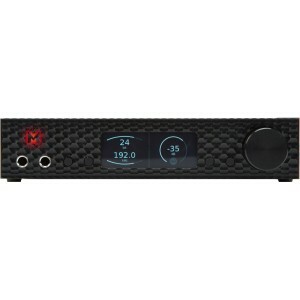 Mytek devices are considered among the most precise, devoted and incredibly musical converters. It is for this reason, that they are favoured in recording studios across the globe. During the recording, making mixes or at the mastering stage, absolute precision of the monitored signal is necessary. Brooklyn DAC+ due to its faithful sound is the ideal solution for studios looking for a stereo converter to be connected between the studio system (DAW / mixer) and the final monitoring/listening system. From the music producer's perspective the reference quality D/A conversion is a necessary part of effective music production. If the combo contains errors, Brooklyn DAC+ will reveal them immediately. All frequency bands are very elaborate and skilfully fuses all the nuances of the recording in a flawlessly reproduced musical area.